First it was the Queen of England, then the President of the United States. 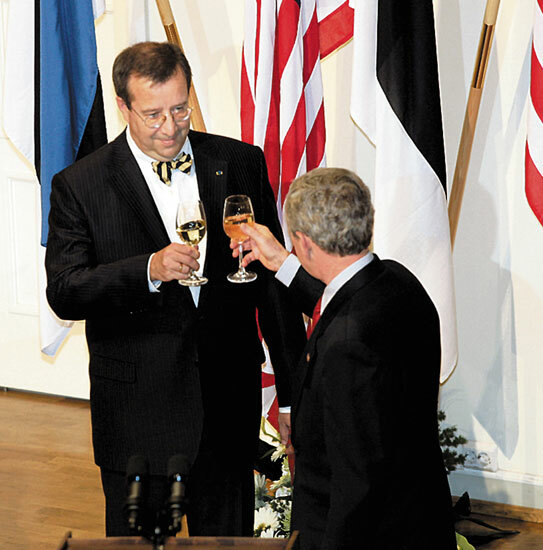 Estonia has been receiving more than its fair share of high-profile visitors this autumn. Last week Mr Bush popped by in Tallinn on his way to the NATO Summit in Riga a fortnight ago. Again, there was a high-profile lunch, this time prepared by Chef Imre Kose of Vertigo. Here's a copy of the menu, served to the 70-odd guests, including the American president George W. Bush and Estonian president Toomas Hendrik Ilves. I'm very pleased to see a dessert using the Estonian ground meal mixture, kama, on the menu, as well as the inclusion of some local dessert wine. ah what a delightful picture showing the face of my favourite president and the backside of my .. eh.. unfavourite (?) president. well well, if there is estonian dessert wine, then that's just what we have to try in the summer! we'll have a little cross-tasting of estonian vs austrian sweet wines and get all patriotic about it. or insanely drunk. or both. It's a shame Bushie didn't take a swig of the real stuff. Maybe he'd start making sense. Or at least be hung over for a day and not speak. Johanna - indeed, a comparative dessert wine tasting (in the interest of research, obviously!) sounds like a wonderful idea. We could focus on Estonian dessert wines in Estonia, and Austrian ones in Austria! ?